There are two parts to this post as you can gauge from the title: Birthday Dinner & Blog Revival. I’ll tackle the blog revival first, as thats the less interesting of the two. I started my blog two years ago. Posted regularly. Life got in the way. I am reviving my blog again today. Somewhat like a tradition, every year on my birthday, it has turned out that DH takes me out on a dinner treat, the venue of which is meant to be a ‘surprise’. All along the way to the restaurant, I’m usually guessing and throwing around names of all restaurants that I know or have been to – albeit unsuccessfully! As we entered, the first thing I noticed was the huge traditional wooden swing at the entrance. A simple, but striking piece of furniture that sets the tempo for the rest of the experience. The ceiling is beautiful woodwork, and the pillars are dull metallic silver that complements the old-world royal feel without being intrusive. There are beautiful bronze lamps placed at strategic areas in the restaurant, adding to the beauty of the place. Heavy wooden chairs with plush cushions give you a feeling of luxury and comfort at the same time. 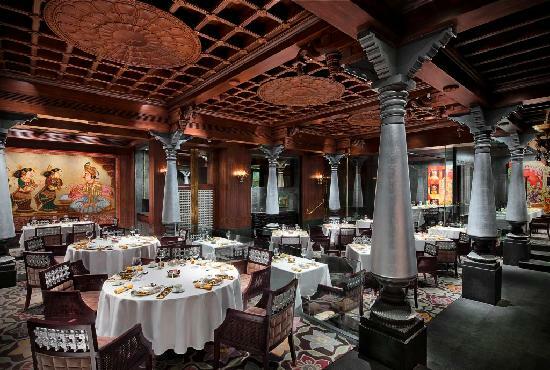 Soothing instrumental violin and tabla music rounds off the ambience to give you a truly royal south indian setting. The waiters were extremely attentive, always in the shadows and appearing at the right time when you are just about to finish what was on your plate, to refill it quickly with the next course. In true south indian style, ‘upasaaram’ and ‘gavanippu’ was top class, with them gently edging us to try the ‘paruppu podi with nei’ or the ‘arachuvitta sambar’, and we relenting to their demands, even when we were already full and on the verge of exploding 😀 We were so drowned in the taste of my amazing birthday chocolate cake, that we forgot to take pictures. The manager very sweetly walked up to us and offered to take pictures and proceeded to click umpteen pictures very patiently, so bonus points. 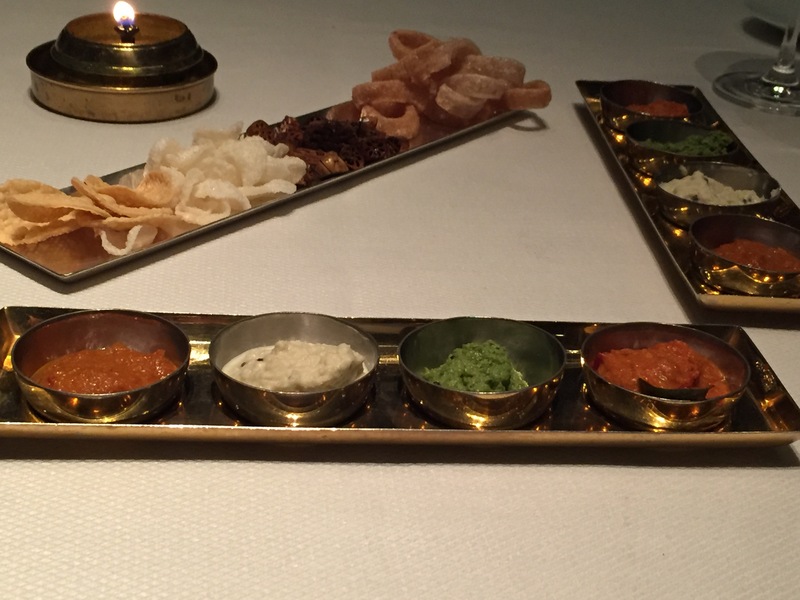 For the start, we were served 4 different types of ‘vadaam’ – a type of fried snack that is usually considered a condiment or accompaniment to rice. 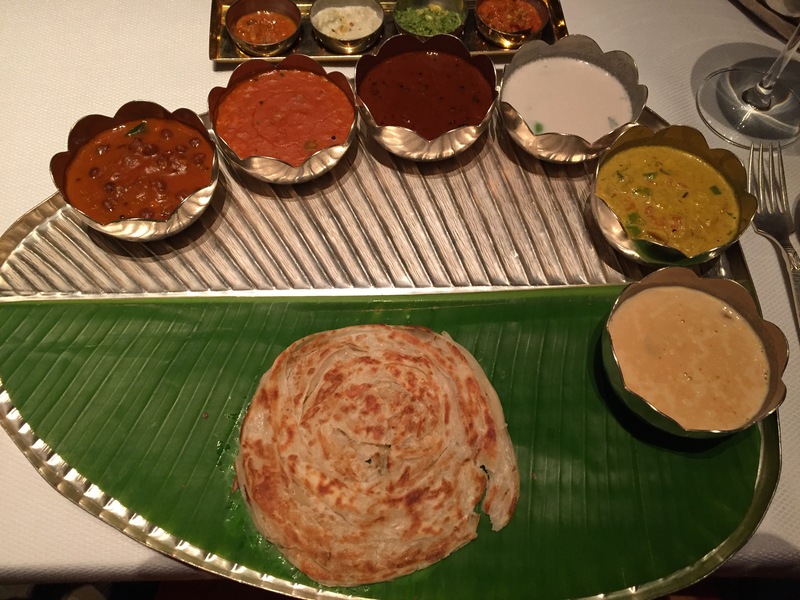 They put a fresh spin on it by serving the vadaam with 4 different chutneys as a dip – pudhina chutney, coconut chutney, tomato chutney and onion chutney. One interesting and yum thing about this platter was the ‘lotus stem’ vadaam, which tasted like ‘vatthal’, and was fantastic. As we were relishing the vadaam, came the soup style Rasam. In general, south indians hold the rasam in very high regard. It can knock off a cold, fix digestion issues, improve your appetite, and at a basic level, be really yummy served with rice. So every south indian household has its own recipe for the humble rasam, and every family has a recipe that is the pride of the cook. 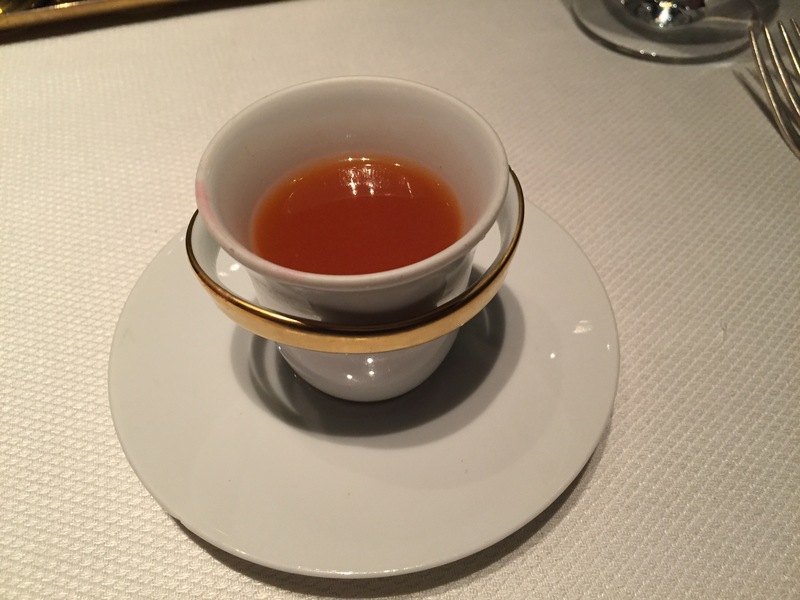 So, when we tasted this rasam, our expectations were quite high. We needn’t have worried, because the rasam was simply out of this world. Wish just the right amount of tart, spice and sweet , this was truly a great dish. 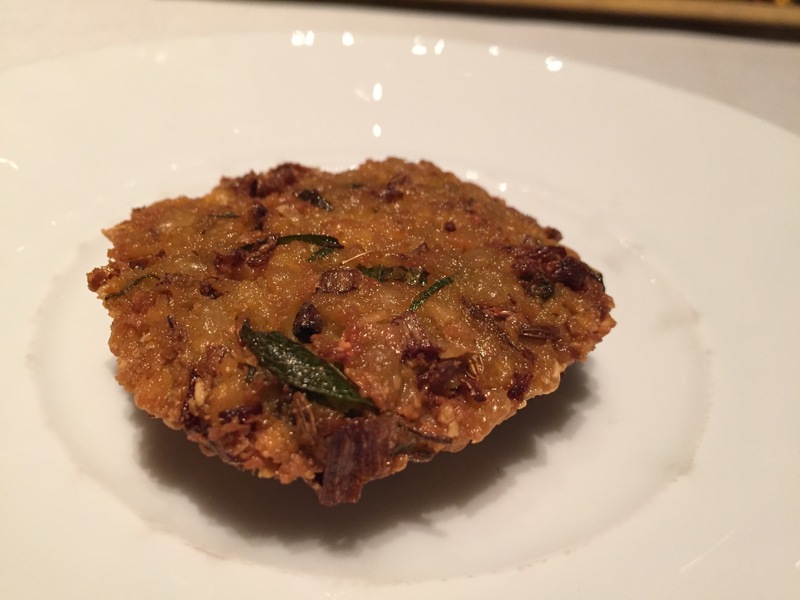 Just when we were oohing and aching about the rasam, landed the ‘vazhaipoo vadai’ on our plates. This is also a fried snack, made of banana flowers in this instance. Fried to a crisp golden brown, it had a crunchy exterior and a pillowy, mildly spiced interior, seasoned just right. Kerala kadala curry, Andhra tomato pappu, Manathakkali vathal kuzhambu, Vegetable stew, Vegetable Kurma, and Paal ada pradhaman. They serve you a ‘parotta’ first, to be eaten with the vegetable kuruma. This was delicately spiced and tasted amazing. Following that, we were served the fluffiest and softest ‘appam’ ever. This, with the really mild vegetable stew, and the kadala curry, really made a nice pairing. The highlight for me, was the ‘paruppu podi’ rice with ghee. This is hands down the best paruppu podi I have ever tasted at a restaurant, and the closest to what my grandmother used to make. I have no words. Please ask for the paruppu podi and taste it, without fail. You will not regret it. Now, I have a husband who is extremely picky about south indian food. He was born and brought up in Coimbatore, so his gold standard, (like many other Coimbatoreans I’m sure would agree) is Annapoorna Hotel. Every dosa he eats, every cup of sambar he tastes, and every ‘full meals’ he orders, is never upto the mark for him. “Annapoorna madhiri varaadhu’ is his constant refrain. So imagine my gobsmacked wonderment when he ate one mouthful of ‘arachuvitta sambar’ rice with drumsticks and small onions (shallots) in Southern Spice and said – this is just like Annapoorna, maybe better! That is surely saying something about the taste of the sambar. I will vouch for that as well, as very few hotels get the sambar right. 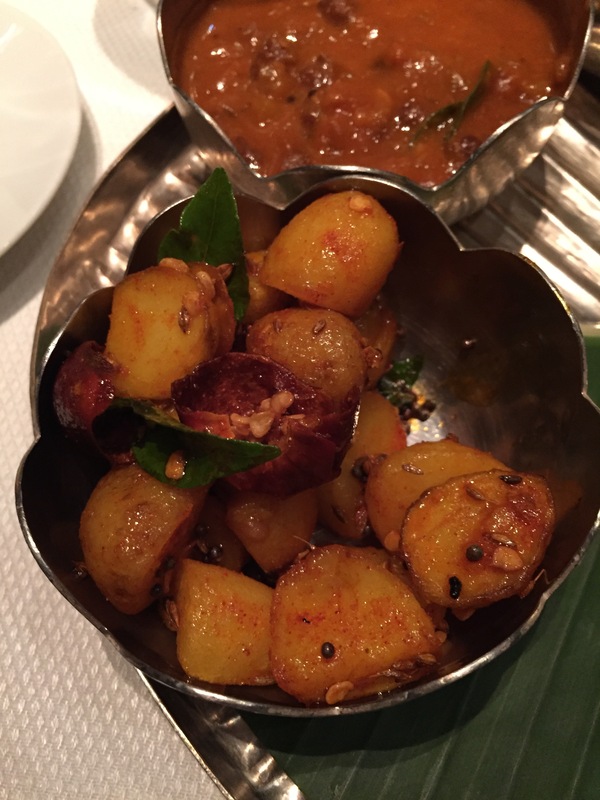 The curry of the day was a much loved quintessential tambrahm favourite – ‘baby potato fry’ :D. Fried to golden brown, this was adequately seasoned and really, how can you go wrong with baby potato fry? It was delicious!! The dessert of the day was a pale pink ‘pal payasam’, which is kind of a pudding consistency dessert, made with pal ada, instead of rice. A light pinkish hue is a very promising thing in this dessert, because the milk gets a sweetness and delightful consistency that is hard to beat! Also, this was like pal payasam, made with milk and sugar instead of jaggery and coconut , which is the traditional kerala way. This dish had just the right amount of sweetness and creaminess to it, without being cloyingly sweet. Then was the curd rice. Creamy, simple curd rice with just the usual tempering. I usually hate adding fruits to curd rice – I prefer it with just the tempering alone, so I was happy with this. But I have to admit that I have tasted much better. Special note to the birthday cake – one of the best ever chocolate mousse cakes that I have tasted – atleast I think it tasted like mousse. Just totally, totally, amazingly yummy cake. We packed the cake and took it home. Update: the cake stayed amazingly fresh for almost a week.